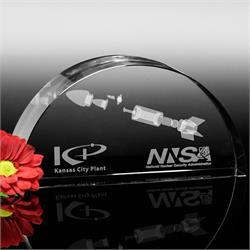 The Arch Award is made of gorgeously arched optical crystal, and it is a wonderful way to show your appreciation. This gift is available in four sizes, and the ample image area allows for personalization. 5-1/2" W x 2-3/4" H x 1-1/2" D; 3 lbs. 6-3/4" W x 3-1/2" H x 1-3/4" D; 4 lbs.